KIEV, Ukraine -- Ukraine marked its national day yesterday remembering the victims of its devastating Stalin-era famine amid controversy over whether the tragedy should be termed a genocide. 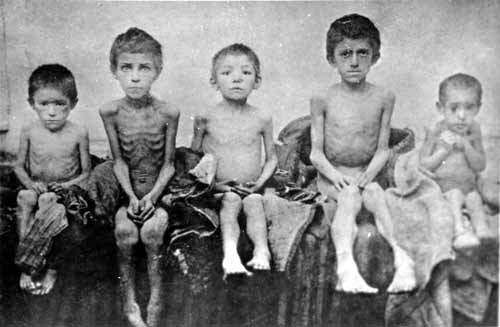 Stalin's forced starvation of Ukrainian peasants was especially hard on children. Many Ukrainian historians say that the famine, which killed between four and 10mn people by different estimates, was intentionally provoked by Soviet rulers to crush an independence movement in Ukraine, but others dispute this. President Viktor Yanukovich took part together with Prime Minister Mykola Azarov in a commemoration to victims of the great famine early yesterday in Kiev, calling on Ukrainians to “bow down the memory of the innocently killed”. Yanukovich laid a candle and Ukrainian symbol of a branch and the ears of wheat at the monument to the great famine victims, the presidency said. Former president Viktor Yushchenko lobbied the United Nations for years to have the famine of 1932-33 in Ukraine recognised as an act of “genocide” against the Ukrainian people, which constantly irritated Moscow. But the pro-Russian Yanukovich rejected this idea and named the great famine “a common tragedy of the nations that composed the Soviet Union” in a meeting of the Council of Europe Parliamentary Assembly in April. “We consider that recognising the great famine as a fact of genocide by one or another nation will be wrong, it would be unjust,” Yanukovich said at the time. Opposition leader Yulia Tymoshenko has accused Yanukovich of outraging the memory of Stalin-era famine’s victims by not recognising it as genocide. “It is very sad that the current leadership denies the fact of genocide, committing outrage upon the memory of millions of victims of great famine,” Tymoshenko said as was quoted on her website. In 2006 under the previous pro-Western administration, the parliament of the former Soviet republic approved a bill recognising the famine as genocide despite opposition from pro-Russian lawmakers.